If you’ve tried out Anthem in any of its comically numerous preview sessions, you might’ve noted that the mouse and keyboard controls don’t feel quite right. That’s still the case in the fully open demo session that began today, but you’ll find those controls significantly improved when the game actually launches. You will get raw mouse input for aiming. The biggest issue early Anthem players noted is that acceleration was applied to mouse aiming – typically a sign of a control scheme directly adapted from analog sticks. 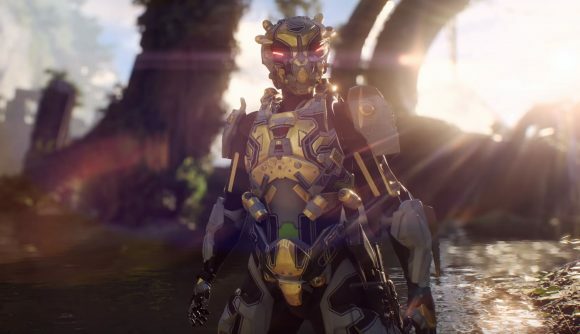 BioWare characterises that as a bug, but regardless of how it ended up that way, it will be fixed in time for the Anthem release date. Flight and swimming controls are also the subject of major improvements. The bounding box for setting your direction is now a circle, which means you’ll have smoother control over turns. You’ll also have auto-centering for flight, which will help bring your movements under control with a natural reset to neutral. Sensitivity sliders have also been vastly expanded, and will allow for raw input if you set Response and Precision settings to zero. You can read more details on exactly what’s changing in an official post to the game’s subreddit. In short, it’s going to control like a PC shooter should. There’s plenty of interesting ground to cover in the Destiny vs. Anthem debate – and our resident Destiny fanatic covers much of it at that link – but one of Bungie’s core differentiators is in just how sublime its shooting controls feel. That’s even more true on PC, and our early shots at Anthem didn’t quite measure up in that regard. Check out our Anthem endgame guide if you’re looking for more detailed info on what you’ll be doing once the initial story wraps up. Anthem is scheduled to properly launch on February 22, proper mouse input and all.